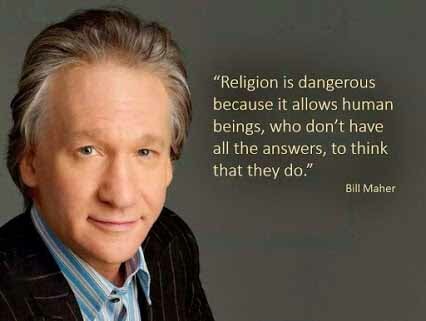 First of all, “religion” certainly is dangerous, and for more reasons than Bill Maher lists in this graphic. Like Maher (a well-known TV host/political commentator/atheist), I want nothing to do with “religion” and here’s why: http://wp.me/p2wzRb-cP. Now, what about “faith” (an entirely different thing) being dangerous? Are there people out there who believe their faith affiliation supplies all the answers to every question? Sadly, yes. In my faith, saying Jesus Christ — whom serious Christians believe is the son of God — is the answer to everything is superficial and, in my opinion, shows a disturbing lack of thought. If there is life on other planets, do they know about God? Why is our world set up so people and animals kill and eat each other to survive? When is Jesus going to return (as the Bible says He will)? Why is spirituality so repugnant to some people and so welcome to others? Does this bother some Christians? Probably. But it doesn’t bother me; serious Christians believe Jesus is God AND man and when He was physically on earth, Jesus set his Godhood aside. Thus the lack of knowledge about His return. But what about my questions? There was a time when some of them, especially the third question, disturbed me greatly. I’m not nearly so disturbed today, but these unanswered questions are still important. Our culture tends to suggest we can be God, with all the wisdom, all the technology and all the resources to command our lives and destinies. But my questions (which I don’t believe science can ever answer) are important and necessary because they remind me that God is God. And I am NOT. So what about you; do your unanswered questions keep you from seriously investigating what it means to follow Jesus and be transformed by His love, His life, His death and His resurrection? Post your thoughts below and let’s have a conversation. I never let unanswered questions bother me. Besides, the biblical character, Jesus of Nazareth is a narrative construct so I have nothing to ask him. Thanks for your thoughts. Please note that while everyone is welcome to read Frank’s Cottage, the material here is written for people who are open to spirituality. If you are asking why someone might not be open to investigating Jesus this suggests it is directed at non-believers. There is a significant different between being a non-Christian and being an atheist. In my experience, atheists are not open to spirituality. Indeed, by its very definition, atheism precludes any kind of spirituality, since that would require a spirit. So who would such a post be directed toward in that case? Which group of non-Christians are you pitching at? Frank’s Cottage content is directed at anyone who is open to spirituality. Again, which non believers are you referring to? Buddhists, Jainists, Hindus? Who? And why would they bother with the character Jesus of Nazareth? It’s aimed at all of them. And at anyone who is spiritual, but not attached to any belief system. And if they’re reading and they find the material useful, then they have their own reasons for “bothering” with Jesus. And why would they investigate this character? Maybe there’s an emptiness in their life. Perhaps the faith group they’re part of us unsatisfactory. Maybe they’re in an emotional or spiritual crisis. Perhaps the topic of this essay is the final hurdle that’s kept them from accepting the gift of Jesus. Even though it’s not obvious to most of us, you and I are in danger – in danger of losing our eternal lives because of the wrong things we do and the right things we fail to do. Because we reject the guidance of our creator. What evidence do you have to confirm this? As a Christian, my evidence is in the Bible, and not just on one part. It’s in many parts of the New Testament. That’s not scientific evidence and, so, it won’t be satisfactory to atheists. And I’m fine with that. Frank’s Cottage is not written with atheists in mind. It’s written for people who are open to spirituality. The bible is not verifiable evidence. It is simply hearsay. In fact, it is specious, suffers from interpolation, many of its characters are mythological and in some parts it contains outright fraud. That you are happy with it suggests a lack of intellectual honesty. This you are entitled to, as you are an adult. But by promoting it, however tacitly, you are simply being blatantly dishonest. Do you really consider this is the type of image you wish to present, especially to children for whom you have a responsibility toward? My previous comment stands, with this addition: please explain what sort of “image” the atheist community believes I’m presenting to children? You believe in Hell and the need of salvation. This is heinous. It is doctrine that can and does cause severe trauma in children ( and adults) and is little more than child abuse. Thanks for your opinion. I believe none of us can make up for the wrong things we’ve done and the right things we haven’t done. Without believing in the gift of Jesus, God will see and judge us on those wrongs. With Jesus, God sees us as perfect. I’ve given you plenty of space to make your points. This conversation is now finished. Are human beings organisms with “souls” or are we simply mechanical beings who think we have souls? Is human consciousness enough to determine what is real and not real? Are we living a dream from which we will eventually wake up, or is this all there is to life? But sometimes I try not to let these questions get in my way of simply living this life fully. I try to simply be. Although these questions will continue to intrigue me and motivate me to search, there will be times when I will choose to sit down, drink a cup of coffee, look outside my window, and enjoy the sunny day. Peace, love and the protection of our planet is not spiritual it is necessary. As an athiest I wonder why people need god to pursue these ideals. I believe in the continuum, my actions today direct the future. I pass my father’s values to my grandchildren in the hope that they, too, will try to create a good world in which all people live together in peace. It is great to see spiritual people reject the dogma of religion in their quest for meaning. This is a good start towards leaving the notion of god behind and creating a a civil democracy void of all superstition. For me personally, once I gained access to God the Father through his son Jesus Christ the sky became the limit. Even Heaven can’t contain Him. The possibilities are limitless and I know a true freedom I have never known. It’s about relationship not religion for me. Jesus’ example of true humility has opened my mind and taught me that it is not my job to judge but to forgive and love. I believe it is in human nature to want to know why. When someone who is driven by this aspect of life comes to know Christ, the author and creator of the universe, they may feel comfort in knowing the One who has all the answers. Life leaves us with issues beyond the scope of our comprehension. Jesus once healed a woman who had a hemorrhage for 12 years. (Luke 8:43-48) I am sure she asked herself and God “Why?” during those 12 years. Did God give her an answer? From the scriptures, it appears she never received an answer. As Christians, we should never presume God will answer our questions directly. If we truly seek Him and His face, He will give us something better than an answer. He will give us what we really need. Himself. Thanks for your thoughts. As Frank’s Cottage is primarily written for non-Christians, they don’t necessarily have the same limits on making presumptions. Faith is not dangerous so long as it is guided by reason. Fortunately most people fit that description (but not enough to make Bill Maher happy). I disagree that atheists cannot be spiritual. Perhaps we are using different definitions?